For British-based Channel Islands-born Jason Martin, paint in the form of oils and pigments conjures him to stretch the possibilities of its application on a canvas of aluminium well beyond the norm with which liquid tusche is brushed onto a lithographic printing plate; all the while compelling him to take inspiration from Minimalism and Abstract Expressionism to make paintings about paint. Though hung on a wall, his “Lesbos” is as sculptural as Jane Lee’s “Belong Series I – Part B”. But while Lee builds a 3-dimensionality with densely packed orderly coils of obvious paint, Martin’s equally 3D result extracts from us a double take: his more spontaneous scrunching together of the chosen material appears a chaotic paper-like amalgamation of Grace Tan’s “Compression” with Zhuang Hong Yi’s “Flowerbed F2016-030”. His “Exotique” gives its nod to the western tradition of almost 2-dimensional gestural painting with the sensuously curvaceous long flowing brushstrokes clearly its sole subject – between which the saturated monochromatic background visibly, and sometimes invisibly, peeks; all achieved with his signature purpose-built comb. Australian Dale Frank takes Martin’s concept of painting in the opposite direction; exploring the potentials of paint and surfaces by pouring paint stripper and acid onto Perspex. As the liquids pool, converge and diverge spontaneously and through careful manipulation, the pigmented varnishes melt and fold into abstract ‘landscapes’ on the otherwise pristine surfaces; punctuating the vast negative space within the acrylic canvases with ‘wormholes that lead to alternate dimensions of infinite immersive and mirrored distortions of pop sheen and jewel-like luminous possibilities’. Drawing from a variety of wood and wood-based materials, American Leonardo Drew extends Martin’s sculptural paintings into abstract sculptures that remain hung on walls too – a homage to his beginnings as a painter and draftsman. His preference for the organic stems from his desire to root in historical evidence the emotionally charged reflections of the cyclical nature of an inter-connected existence between humanity and life. His “Number 16C” is thus a contemporary charcoal charred version of Rosalie Gascoigne’s pieces of “Sunflowers” plywood gleefully protruding like the salsify heads she had used in her “The Crop”, but punctuated with a rainbow of optimistic colours, while he renders his “Number 135D” with weavings of salvaged forest twigs onto hand made paper in a similar vein to that achieved by Gascoigne with swan feathers and galvanized wire on wood in her “Feathered fence”. Mainland Chinese Ren Ri ups the ante with his choice of organic material by manipulating bee wax the way Yukinori Yanagi creates ant farm tunnels through large transparent boxes of coloured sand dyed to look like US 1 dollar bills in his “Money/Flower” series. 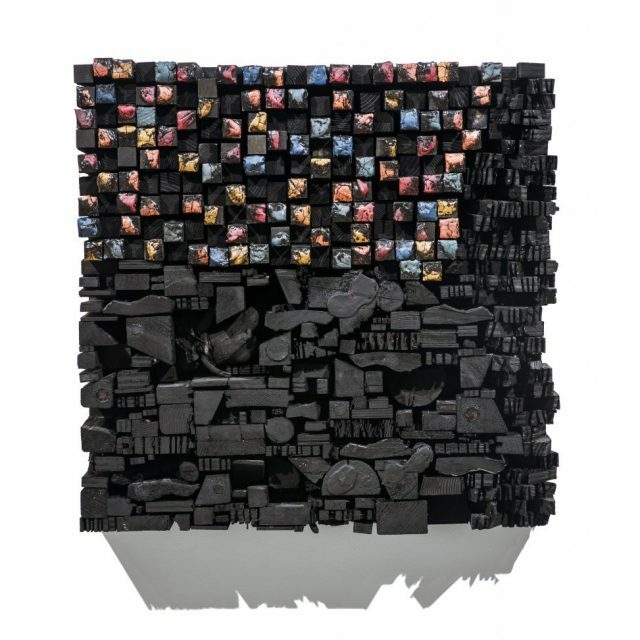 But while Yanagi releases live ants into these sand boxes to uninhibitedly create his signature art, Ren introduces the queen bee and the rest of her hive into transparent polyhedrons and cubes with inner frameworks of wooden dowels; rotating the forming bee wax sculpture every 7th day primarily on the whim of the roll of a die – an act that references the biblical concept of God creating Earth in 7 days; where the bees have the freedom to build as they are wont within the constraints of change Ren imposes on the day God rested. The results: no 2 beehives in Ren’s “Yuansu Series” are ever similarly structurally shaped – the morphed actualities being infinitely more divergent than the farms Yanagi’s ants can ever freely dig out. Singaporean Ezzam Rahman continues to bravely fashion art with a highly personal organic material – generous flakes of his own skin and nails; but taking the fragile miniature flowers sculpted for his “Here’s who I am, I am what you see” to a totally different plane: while we can instantaneously recognize that dried human epidermis has been used for these blooms, we are hard put to make that recognition for those he has blossomed into existence for “i guess it is funnier from where you are standing” series. This Madame Tussauds-like realism Rahman accomplishes by colouring each ‘petal’ with the same eye-catching palette of hues Mother Nature bestows on her Eden of floral; elevating his improvisational objects to a loftier realm where the impermanence of value and worth of the instinctively desired beauty, poetics and seduction is interrogated. Displaying Rahman’s works alongside Korean Chun Kwang Young’s extends the query to what constitutes the ephemeral essence of this East Asian culture. For Chun, it translates into using Korean mulberry paper, torn from old books, as his material oeuvre for metaphorical associations – when wrapped like medicinal triangular bundles its delicately translucent, yet strong and durable qualities undergird his investigations into ideas of healing arising from universal conditions of human trauma and suffering through socio-cultural issues specific to South Korea. Given this sentiment, attempts at drawing parallels between the lunarscape-like surface of some of Chun’s ever expanding collection of “Aggregation” with fellow country woman Hague Yang’s “Color-blown Craters and Dunes” series break down. While Yang worked solely on extending the boundaries of making art with hand made paper, Chun’s driver involves broadening the evaluation of our own human spirit. As mulberry paper undergirds the Korean identity, the brightly coloured African batik fabric sold at Brixton market in London draws its roots from an inspiration by Indonesian design and a Dutch mass-production for export to its colonies in West Africa, where it became a new sign of African identity and independence in the 1960s. British-Nigerian Yinka Shonibare MBE’s deployment of it to stylishly clothe his “Boy Balancing Knowledge” sculptured fiberglass mannequin therefore affords his works an authentically deep connection to his cultural background. This personal cultural connection is also made by American-Puerto Rican Carlo Rolón aka Dzine with his “Argentinian Royalty” and “La Plena (Triple Diamond Fence)” – in this instance, with the ornate aesthetic style favoured by the American middle-lcass during his childhood in the 1970s, where walls and furniture were as embellished with exotic colours, textures and patterns as mirrors were aplenty in his family’s homes to add a sense of spatial extension aestheticized by a grandeur referencing upper-class culure. Indonesian Gatot Pujiarto, on the other hand, takes elements from the personal everyday experiences of abnormalities, weirdness and tragedy he gets from people and events in his surroundings; even friends’ stories, TV shows and the news. These he playfully literally stitiches onto canvases with fabric patched, cut, pasted on, braided and torn to highligh the outlines of forms within his collaged tapestries “Crazy Night” and “Topend Malam (Night Mask)” – all metaphors of man’s distressed action upon nature as counter productive to the overarching aim of world harmony within a truly masculine Javanese artistic aesthetic that marries Jennifer Ng’s “Pulling At Grass To Make It Grow” with Izziyana Suhaimi’s seamstress wizardry and Ran Hwang’s haberdashery’s compositional mastery. The material resonance within this group of exhibited artists therefore flits from the philosophically conceptual to the occupationally, culturally or personally intellectual, from sublime soberity to glee at the drop of a hat; all in as divergent a showcase as that presented at STPI’s “Looks Good on Paper” exhibition and at one level better – each substance has been innovatively deployed in artistic creations that remain mindful the best way to persuasively draw an appreciation that becomes embedded in our psyche is by not forgetting the aesthetics. Give a standing ovation for this ‘award-winning’ material play before the “Materialised Condition” group exhibition at Pearl Lam Galleries, 15 Dempsey Road, #01-08 Dempsey Hill, Singapore 249675 ends on 14 May this year.